Do you have a pool deck, driveway, floor, or any other slab on grade condition that is in need of beautification? 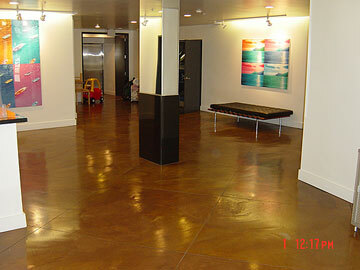 If so contact us as soon as possible for a free estimate on decorative floor coatings you may need. We install a variety of textured coatings, stamped overlays, and stained concrete in all of your favorite colors and patterns. The textured decking system pictured is very popular for pool decks due to the increased slip resistance and cooler surface temperature it provides as well as the fact that it is very aesthetically pleasing. We do all kinds of deck repair in Southern California as well as a wide variety of other construction, below grade, roof deck repair, balcony coating and epoxy coating work. (listed in our Deck Coatings Section) is the Weather Deck System. 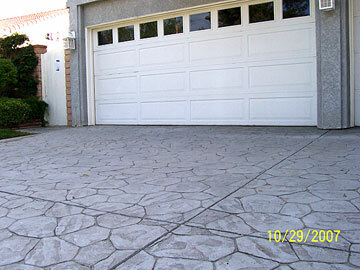 This is a stamped concrete overlay system used in Simi Valley, California. 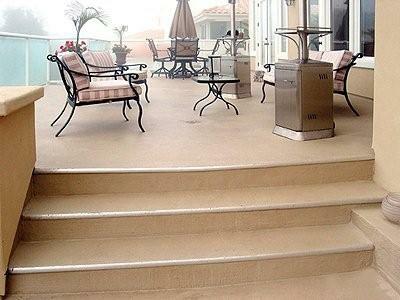 With a wide variety of stamp patterns and colors just imagine what Southern California Decking, Inc. could do for you. This is a stain concrete and epoxy flooring system installed in a lobby of a multi-unit complex in Santa Monica, California. Take your floor to the next level with a wide variety of systems we can install.